TV trays are one of the best inventions of all time. And, in the age of technology, they are even more functional. Generally, they used to be used for eating while watching TV. Now, they double up as a laptop or tablet table. And for the simple fact that we wanted a table to do our work when and where we please, we went searching for the best TV trays and tables. So, we began our search with functionality in mind. We wanted a table that can hold both our meal and our laptop — space was a big factor in our decision. And, although not all of our picks have the optimal amount of space, most of them do. And the ones that don’t, they have their own purpose in the TV tray world. Next, we looked at quality. We needed something that was going to handle the weight of a computer and the hours we spend at the screen. And, for those moments we recklessly have a beverage sitting next to our computer, the best TV trays need not be wobbly. Finally, call us vain, but the TV trays have to look good. We love our space and the inspiration our space gives us. So, the materials used and the design was an important factor in picking out the best TV trays and tables. Winsome Wood has been in operation from 1977 and has more than 40 years of experience in designing and manufacturing furniture products. We have featured them twice in our list of TV trays and here’s presenting our first pick – The Lucca Snack Table. The beautiful Walnut finish on this table would make it standout and provide a soothing contrast to your bright interiors. You wouldn’t want to tuck this piece of furniture away in the corner ! This pick for the best TV trays made it to our list because of it’s color and finish. The top is made of Medium-density Fiberboard. This set features a double-glide design that can be folded for storage. And when you’re ready to use, they seamlessly open right back up. 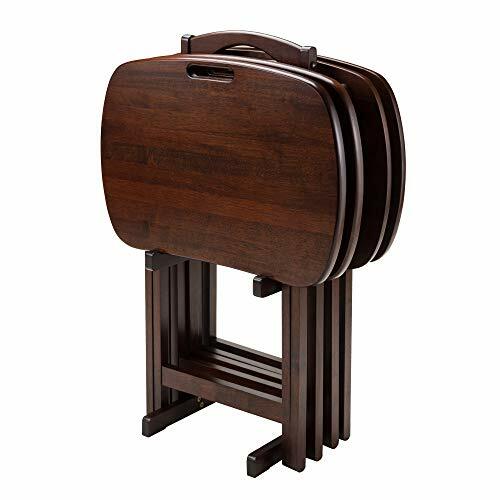 The Winsome Wood TV Tray Table measures in at 26 x 26 x 24 and the manufacturer provides dimension in each position – tray table top open, tray table top closed as well as when in storage. Our take: If you want the best of the best, this set is at the top of the food chain, or should we say, TV tray chain. The materials are high end and the quality is unbelievable. And, in the end, it’s not going to appear as just as a TV tray, but is going to take an important place in your living room. We are a sucker for light and bright so that’s what initially caught our attention with this pick for best TV trays. The Lifewit Wooden Portable TV Tray Snack Table is an indoor/outdoor table that features a white finish coating to protect it from moisture and corrosion. This TV tray can be folded for easy storage and is constructed of solid wood. The dimensions of the table are approximately 17.7 inches in width, 24 inches in height and 11.8 inches in depth. And, perhaps the best part, there is no assembly required. 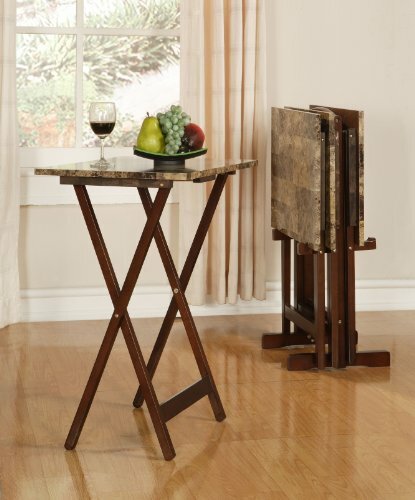 Our take: We love the look and the functionality of this table. We can see it set up as a night table, out on the patio, used for a those unsuspecting bouquet of flowers and of course for some dinner with a side of internet. 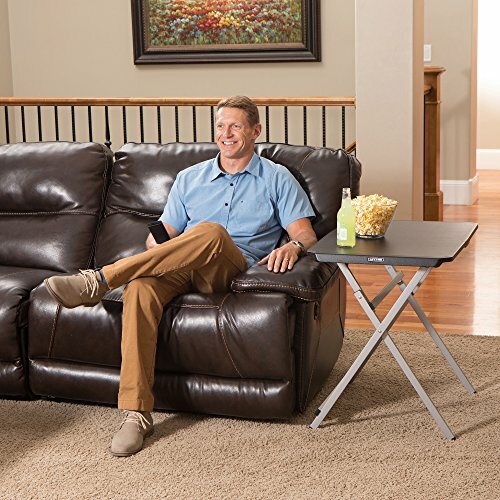 This table is durable and wobbly-free, so you’re going to get quality with this TV tray. However, our only complaint is that it is on the small side and we like to spread out a bit. And, since this table looks so good, propping up two of these tables side by side is not out of the question. The Linon Home Decor Tray Table got a spot on our list initially because of the classic design. And it maintained that spot due to it’s durability and functionality. Made of metal, these TV trays fold up flat for easy storage. In addition, these tables come with polished metal legs, a laminate surface and padded feet to protect the floors. Each table measures in at 18.9 inches in width, 26 inches in height and 15 inches in depth. There is thankfully no assembly required and they come in your choice of 5 different colors and designs: Chevron Black & White, Diamond Eye Moonlight Blue, Park Place Black & White, Park Place Capri Breeze and Summer Peek Grey. Our take: They are multi-functional and durable. The laminate surface will ensure the longevity of the tray while the metal construction will ensure stability. And, although these tables are lightweight, they are constructed uniformly so there will be no wobbling. Finally, the designs are done tastefully and will add a pop of funkiness to any space. Although this isn’t your typical TV tray that folds and stores, it is an amazing solution for multi-tasking while eating or perhaps surfing the web. The NEWVANTE Sofa Table is made of 100% eco-friendly, natural bamboo. 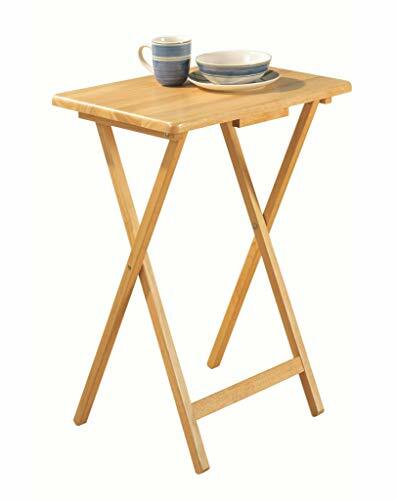 Which means this table is as sturdy as you’re going to get. In addition, since it doesn’t fold, it’s going to be even more sturdy with the thicker legs and the Z style of structure. The TV Tray weighs in at 12.12 pounds and measures in at 23.6 inches in length, 25.6 inches in height and 15.7 inches wide. It is easy to assemble and is meant to be a more permanent piece. And, since it doesn’t fold and store, depending on how much time you spend at the TV or the internet, this could suit you just fine. Our take: This is at the top of our list for best TV trays because it fits our needs perfectly. It has a large “tray” size so we can eat and get work done at the same time. It is also extremely sturdy, so when we have drinks on the table, we don’t have to worry about spillage, as long as we keep our elbow in check. This is a great option if you’re buying for the whole family. 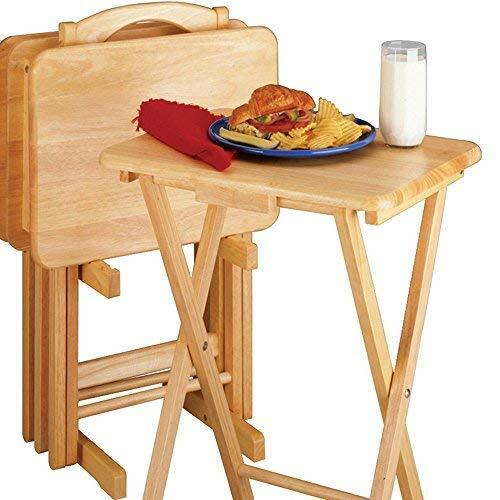 The PJ Wood Folding TV Tray and Snack Table comes with 6 folding tables and can be used for both indoor or outdoor use. Made of powder-coated heavy duty steel and solid wood, these tables are both sturdy and durable. So much so, each one can hold up to 44 pounds. In addition, they are lightweight, so they’re easy to maneuver and easy to store. The Table measure in at 18.9 inches in length, 15 inches in depth and 26.5 inches tall. This set included 6 multicolored tables: Pink, Magenta, White, Sky Blue, Yellow and Cyan. Our take: This i.s a great budget option if you’re looking for your basic, although fun, TV tray. And, since it comes in a set of 6, this is great if you’re accommodating a lot of people. It’s also great for parties and patios. However, they are on the small side. In addition, there isn’t a storing cart included. They do stack up nicely, though. 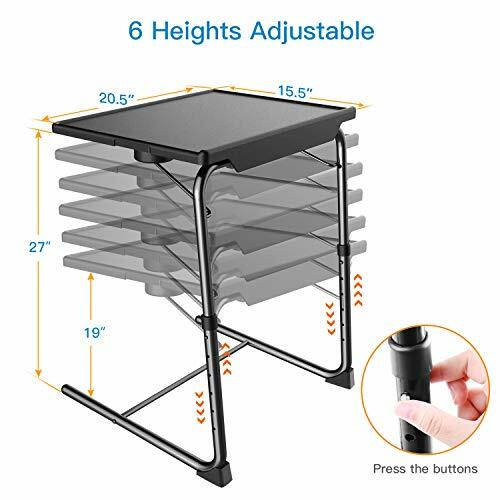 If you are looking for a tray table for your laundry room, patio or your garden, the Aingoo Folding Tray table would be a great fit. The unit is made of 12 mm MDF and can hold a load of up to 220 lbs. The retaining clips attached to the back of the main unit provides stability while the metal sheet reinforcements provide strength to the legs. The plastic protectors at the base of the unit ensures that the table will not make scratches on the floor. It can also function as a snack/dinner table while you watch TV or as a table to hold your laptop/table. A nice bonus is that there are 2 units in this item. 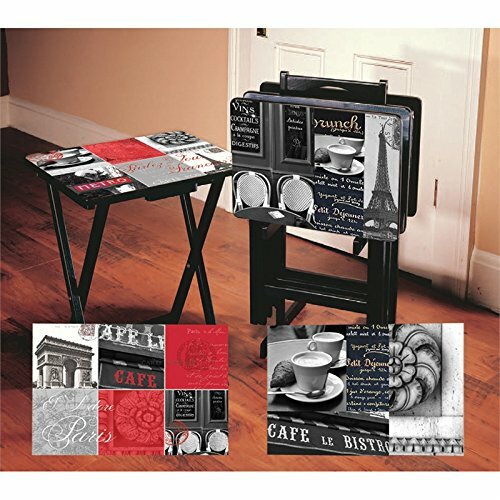 The Cape Craftsmen Paris Cafe TV Trays with Stand come in a variety of designs: Country Kitchen, Cucina, Elegant Farmhouse, Lodge Postcards, Mod Blue and White, Nautical, Rustic Wine, Seafood Market, Tuscan Wine and Wine Label. These TV tray sets comes with 4 tables and a storage stand. Each table is 19.5 inches in width, 14.5 inches in depth and 24.75 inches tall. The stand is 19 inches wide, 14 inches in diameter and 32 inches tall. The Cape Craftsmen TV Trays with Stand are made of MDF with heat and water-resistant tops. And for a heads up, there will be some assembly required but nothing too drastic. Our take: Because of the designs, these tables are perfect for those that savor country or city style. Or, for those that romanticize a simpler life. Being made out of MDF, these TV trays are durable and sturdy. However, they are best used lightly. Out of all of our picks, this is probably the pick with the least amount of longevity. So, if you’re just looking for TV trays for every now and then, this is a good pick. If you’re looking to get more strenuous use out of a TV tray, check out our other picks. This set of TV trays will bring some elegance to a seemingly un-elegant situation. The Winsome Wood Lucca 5 Piece Set TV Tables are made of Medium density fiberboard (MDF) with wood legs and comes in a walnut finish. Each table measures in at 22.9 inches in width and 29.5 inches in height and are extremely portable. 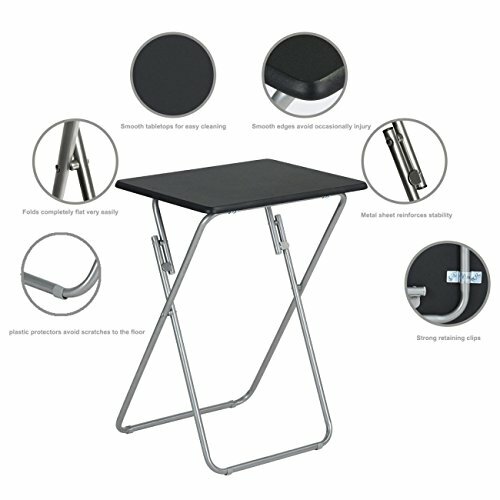 They offer a cutout handle to easily lift the table off the stand and set up. And they just as easily break down. Our take: Since these are made with MDF, they are extremely durable and sturdy. And, since this set comes with 4 tables, it is a great value. In addition, these tables are a really good size and quite roomy. Did we also mention they look elegant? Who knew you could have a fancy dinner with TV trays?